The premise of Habanos’ new Añejados line, first introduced in 2015, is simple: Cuban cigars aged for at least five years in their box before being released. The appeal is obvious, too. Cuba’s national cigar maker has a reputation for distributing cigars that, even if not obviously under-aged, benefited from extended post-purchase aging. Now, rather than age the cigars yourself, you can pay a premium for cigars with five to eight years of age. The Hoyo de Monterrey Hermoso No. 4 Añejados is a new size (5 x 48) for the Cuban Hoyo de Monterrey lineup. I purchased two samples for about 18 euros each, including taxes. The cigar features solid construction despite it’s slightly spongy touch, a frequent characteristic of Cuban cigars. But combustion is excellent, with a open draw, even burn, and solid ash. The dominant flavors include balanced cedar and café au lait. There’s also hickory notes along with subtle clove, especially towards the second half of the cigar. This is a good Cuban cigar, with medium-bodied flavors, though it’m not sure it is far better than a standard Cuban Hoyo de Monterrey that has a year or two of age. 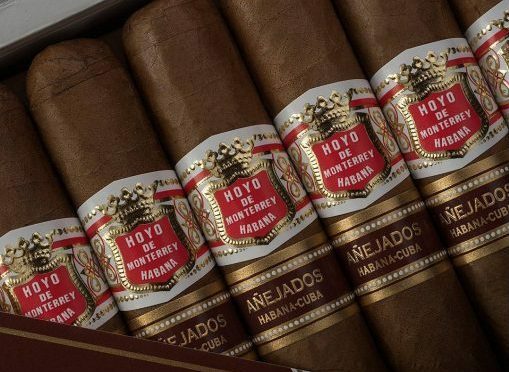 Ultimately, you pay a premium for an assurance of a cigar that isn’t underaged, but the balanced, rich flavors of Hoyo de Monterrey Hermoso No. 4 Añejados still earns it a very solid rating of four and a half stogies out of five.